(Nanowerk News) Take gold spirals about the size of a dime…and shrink them down about six million times. 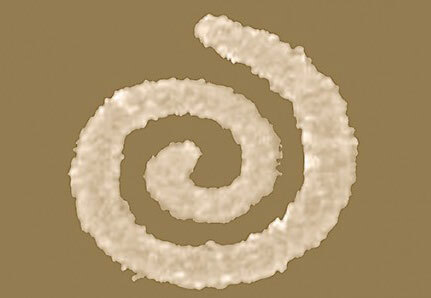 The result is the world’s smallest continuous spirals: “nano-spirals” with unique optical properties that would be almost impossible to counterfeit if they were added to identity cards, currency and other important objects. 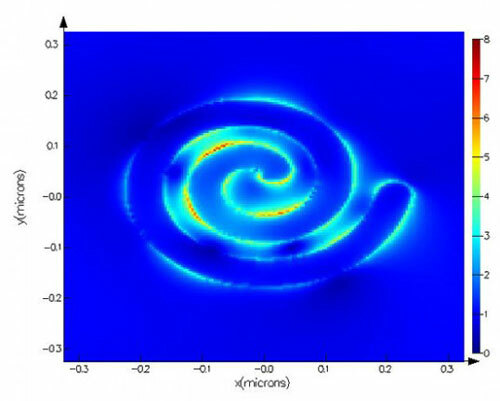 Students and faculty at Vanderbilt University fabricated these tiny Archimedes’ spirals and then used ultrafast lasers at Vanderbilt and the Pacific Northwest National Laboratory in Richland, Washington, to characterize their optical properties. The results are reported in a paper published online by the Journal of Nanophotonics ("Efflcient forward second-harmonic generation from planar archimedean nanospirals"). “They are certainly smaller than any of the spirals we’ve found reported in the scientific literature,” said Roderick Davidson II, the Vanderbilt doctoral student who figured out how to study their optical behavior. The spirals were designed and made at Vanderbilt by another doctoral student, Jed Ziegler, now at the Naval Research Laboratory. Most other investigators who have studied the remarkable properties of microscopic spirals have done so by arranging discrete nanoparticles in a spiral pattern: similar to spirals drawn with a series of dots of ink on a piece of paper. By contrast, the new nano-spirals have solid arms and are much smaller: A square array with 100 nano-spirals on a side is less than a hundredth of a millimeter wide. When these spirals are shrunk to sizes smaller than the wavelength of visible light, they develop unusual optical properties. For example, when they are illuminated with infrared laser light, they emit visible blue light. A number of crystals produce this effect, called frequency doubling or harmonic generation, to various degrees. The strongest frequency doubler previously known is the synthetic crystal beta barium borate, but the nano-spirals produce four times more blue light per unit volume. When infrared laser light strikes the tiny spirals, it is absorbed by electrons in the gold arms. The arms are so thin that the electrons are forced to move along the spiral. Electrons that are driven toward the center absorb enough energy so that some of them emit blue light at double the frequency of the incoming infrared light. The nano-spirals also have a distinctive response to polarized laser light. Linearly polarized light, like that produced by a Polaroid filter, vibrates in a single plane. When struck by such a light beam, the amount of blue light the nano-spirals emit varies as the angle of the plane of polarization is rotated through 360 degrees. The effect is even more dramatic when circularly polarized laser light is used. In circularly polarized light, the polarization plane rotates either clockwise or counterclockwise. When left-handed nano-spirals are illuminated with clockwise polarized light, the amount of blue light produced is maximized because the polarization pushes the electrons toward the center of the spiral. Counterclockwise polarized light, on the other hand, produces a minimal amount of blue light because the polarization tends to push the electrons outward so that the waves from all around the nano-spiral interfere destructively. The combination of the unique characteristics of their frequency doubling and response to polarized light provide the nano-spirals with a unique, customizable signature that would be extremely difficult to counterfeit, the researchers said. So far, Davidson has experimented with small arrays of gold nano-spirals on a glass substrate made using scanning electron-beam lithography. Silver and platinum nano-spirals could be made in the same way. Because of the tiny quantities of metal actually used, they can be made inexpensively out of precious metals, which resist chemical degradation. They can also be made on plastic, paper and a number of other substrates. If nano-spirals were embedded in a credit card or identification card, they could be detected by a device comparable to a barcode reader“If nano-spirals were embedded in a credit card or identification card, they could be detected by a device comparable to a barcode reader,” said Haglund. The frequency doubling effect is strong enough so that arrays that are too small to see with the naked eye can be detected easily. That means they could be placed in a secret location on a card, which would provide an additional barrier to counterfeiters. The researchers also argue that coded nano-spiral arrays could be encapsulated and placed in explosives, chemicals and drugs – any substance that someone wants to track closely – and then detected using an optical readout device.